Do you have BI Performance Anxiety ? BI is key to enabling companies to turn oceans of data into predictive models and actionable decisions. However, a survey of 353 executives in large companies, reported that their chief BI concern was the performance of various BI solutions. Development, support and enhancement teams are typically deployed to address BI performance challenges with varied success. But most companies don’t have a dedicated focus on performance. A BI Center of Excellence (BI CoE) measured by performance KPIs and service metrics is one solution to this problem. This is not an area that traditionally draws high-level attention or is featured in a dedicated CoE initiative, yet in the right circumstances it offers unique value. A typical Business Objects implementation may get 250 enhancement requests a year along with 2000 production support requests depending on the complexity and maturity of the environment. Responses to these requests can take anywhere from a week for an enhancement request to a few hours for production support. It is not uncommon for companies with about 1000 users and 20 functional departments to spend in excess of a $1M in support and enhancement of a BI implementation. Some of these can be hidden costs such as opportunity costs of specialized resources which are not directly measured. 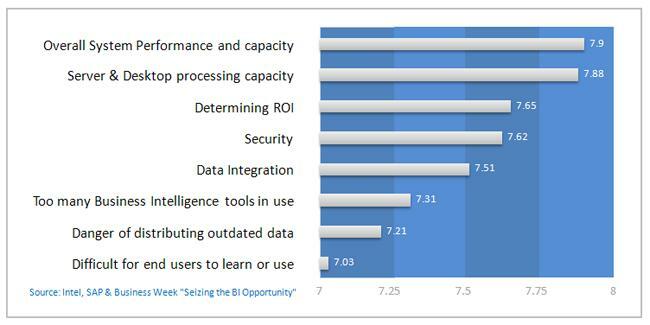 Implementing a dedicated BI COE with efficient processes can improve BI performance while savings of up to 50% over traditional approaches. The fundamental goal of a BI implementation is to create valuable information that directly impacts business decisions. BI performance can make the difference between a good decision and a bad one. Corporations who have invested considerable resources on solutions are looking to get their money’s worth in performance. A well-executed BI CoE can directly impact the ROI of this investment. BI is high on the strategic agenda of CIOs as companies require more insight into information as data keeps accumulating. Better decision-making and competitive intelligence is well beyond building data warehouses and data marts. Transforming raw data into meaningful and useful information, trends and forecasts that can be used to enable more effective strategic, tactical, and operational insights and decision-making requires a solid architecture, development, QA/testing and a support/enhancement structure. A BI CoE can address both requirements. ← Is Your BI Project in Trouble? this anxiety can take its toll on the quality of life of you and your child. Exercise is a great way to keep fit but it’s also good for the mind and emotions.